Defenseman Petteri Lindbohm battles Blue Jackets left wing Matt Calvert in a preseason game at Columbus on Tuesday night. The St. Louis Blues cut their roster to 32 players Wednesday, and among those sent elsewhere were veteran defensemen Chris Butler and Petteri Lindbohm and forward Beau Bennett, all of whom were placed on waivers. 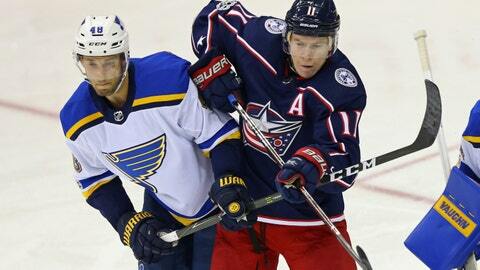 Butler, 30, a native St. Louisan, played 39 regular-season games with the Blues over the last three seasons. He also has played with Buffalo and Calgary in his NHL career since 2008, totaling 13 goals, 71 assists and 185 penalty minutes in 388 regular-season games. Lindbohm, 24, has much less NHL experience than Butler, though he has worn the Blue Note in 40 regular-season games over the last three years (seven games last season). He had two goals, one assist and 37 penalty minutes during that time. Forward Beau Bennett was signed as a free agent to a one-year, one-way contract over the summer. He had played 194 career regular-season games with Pittsburgh and New Jersey over the last three seasons. The Blues assigned six players to the American Hockey League: forwards Conner Bleackley (Chicago), Mackenzie MacEachern (Chicago) and Adam Musil (San Antonio), defensemen Jordan Schmaltz (San Antonio) and Thomas Vannelli (San Antonio) and goaltender Ville Husso (San Antonio). Two forwards were assigned to their junior teams: Jordan Kyrou (Sarnia) and Robert Thomas (London). The Blues will travel to Kansas City to host the Minnesota Wild in a preseason game at 7 p.m. Thursday at Sprint Center.